What kind of jerky dude doesn’t like a good sausage? Not me. I could eat tube steaks morning, noon and night. Especially these incredible ones from The Fatted Calf. I got some pig meat (from normal-sizedpigs) that was cooked in wine and packed in olive oil. Taylor, the proprietor, calls it Tonno di Maisle and told me that it’s good to use the oil to dress a salad or beans. Crepinettes – they make these as specials. They use different meats (including duck and pork) depending on what they have going and add interesting ingredients like olives, wild mushrooms, herbs, whatever compliments these patties of perfection. Saucisson Sec – delicious dry salami – a real winner. Pancetta – the most delicate and delicious ever. Wieners – very nice, but a teeny bit lean for my taste. Breakfast sausage - tasty, salty pork sausage without casing - Taylor says you can mix with ground beef for superior meatballs. Duck Rillettes – the fat slowly melts from the heat of the toasted bread as you spread this luxiourious meat carpet over your levain. Toulouse – lovely pork sausage that would be nice to pop in a cassoulet sometime. 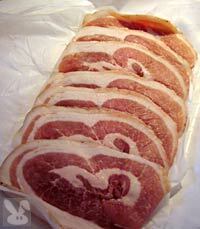 Slab bacon – fantastic motivation to cook up Rancho Gordo beans. and even, Mortadella, which is rich and fragrant and makes a dynamite panini. Hot Italian sausage and Crepinettes, before and after cooking. I always go back to my favorites like the hot Italian, merquez, breakfast, saucisson sec, crepinettes (whatever kind they have that day) But the MADMAN is the Fegatelli ($2.50) which are high end 'slim jims' with a coarse grind and a subtle spicy kick. So, if you are in the mood to BLOW YOUR MIND, head on down to the Fatted Calf.